Helllloo Out There! Today I'm playing along with the Newton's Nook Inky Paws Challenge #44. 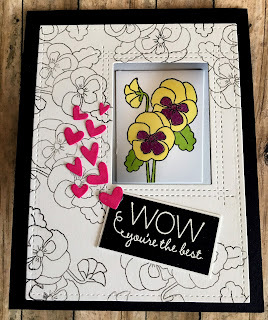 To create this top fold A2 card I used a stitched die to adhere to the black card base and then die cut the black card base and some white cardstock to create a window with the My Favorite Things window die. Next I stamped the little pansies (I surgically removed the stems...I know, pretty scary, right?) in Versamagic Black Onyx ink all over the white panel to create a background. I stamped the full pansy image on the square that was left from cutting the window. I colored it with Copics and I must admit this was the first time I used Copics and wow, they are certainly different from my regular watercoloring comfort zone. I matched up this little image to fit the window. I die cut some little hearts and stamped an image from an old Stampin Up set I've had for awhile and never used. I embossed it in white onto black cardstock and cut some white cardstock a little larger than the black and adhered it with some glue dots. As a side note, I have to say that I've gotten totally organized and it took me about a year, but I have all my stamps and dies catalogued into Evernote so that I can actually find what I have ant start using everything. What a help! Now that I've retired I'll actually get into the creative zone more - Yay!! This card is lovely! 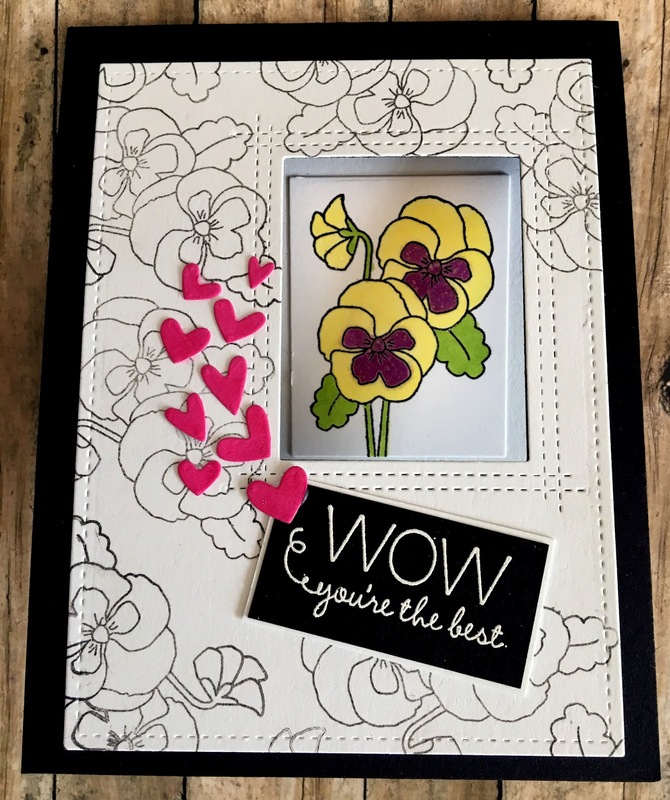 I love the way you stamped the flowers in black and white and left the one image colored! It really pops! The cute little trail of hearts is a nice touch too! Thanks for playing along with our Inky Paws Challenge! This is gorgeous! What a cool background! Thanks for joining us at the Inky Paws Challenge!